Modern lenses are incredibly powerful tools, masterpieces of optical manufacturing. Despite incredible amount of care that goes into their construction, they’re not always perfect. Like most things in life, when it comes to lenses, the best quality optics are almost universally very expensive, but even the top-of-the-line lenses that cost several thousand dollars can still have some issues with distortion. The most frustrating of these is probably something you’ve seen in your own photos: colour fringing. but with a bit of work in Photoshop you can correct the problem fairly easily. Also known as ‘chromatic aberration‘ to the more technically-minded, there are a number of ways that colour fringing can impact the quality of your images. Probably the most common type is a slight green, pink or purple fringe of colour around the edges of certain objects, but depending on your lens, subject, and lighting conditions, it may show up in other ways. This type of colour fringing tends to be more common on the edges of subjects that are backlit against a brighter area, but they can occur almost anywhere along the lines where two areas of widely different contrast meet. Adobe software engineer Eric Chan, the programmer responsible for the chromatic aberration fixes in Photoshop and Lightroom, explains the different types of chromatic aberration in a post on the Lightroom Journal (which you can read in full here). “Red-green and blue-yellow fringes at the image periphery result from lateral chromatic aberration. This problem is relatively easy to fix … purple and green fringes in out-of-focus areas and along high-contrast boundaries are much more problematic. Fortunately for dedicated image editing perfectionists everywhere, colour fringing is such a common problem that Adobe developed a section of Adobe Camera Raw (ACR) specifically to help eliminate it. If you’re not familiar with ACR yet, you should switch to shooting in RAW mode (read more on why you should shoot RAW here). Loading your RAW image file in Photoshop automatically starts Camera Raw to allow you to modify a wide range of settings, and this is the easiest method to remove your colour fringing – or at least the majority of it. Switch to the ‘Lens Corrections’ tab, and you’ll be presented with a few options for correcting a variety of lens issues, as you can see below. Most of the options on the profile tab are automatic solutions for correcting lens distortion, which are fantastic when they work properly. Unfortunately, as helpful as they can be, they aren’t always the best solution. It’s always worth a try, though, so check the ‘Remove Chromatic Aberration’ box and see if it does the job. Because of how subtle colour fringing can be, it’s important to review your photo at 100% zoom to ensure that your chosen settings are having the desired effect. You might not notice any fringing at all when the image is zoomed out, but it will rapidly become apparent if you plan to make any prints – and it’s always a bit frustrating to have to go back after you’ve printed to fix something you could have corrected earlier. 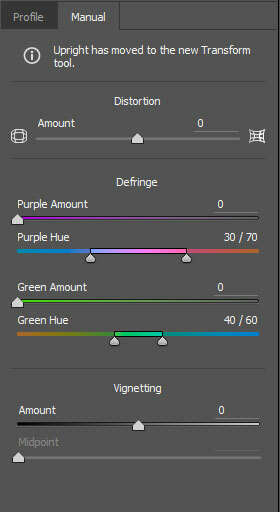 If the automatic solution isn’t fixing all the colour fringing you see, it’s time to switch over to the ‘Manual’ tab, which offers a simple and handy array of sliders that can correct the more common types of colour fringing, as you can see in the image below. As powerful as this tool is, it’s not the last option you have. If the manual sliders aren’t able to remove all touches of colour fringing, the best solution is to load the file completely into Photoshop and switch to the Clone Stamp tool. This can wind up being incredibly time consuming, but it’s often the only recourse for fixing persistent colour fringing, and it offers an incredible amount of control. As when doing any clone stamping, you should be sure to work on a separate layer so that all your edits are non-destructive. This is easier than it may sound, and it’s a good habit to get into. Just create a new layer, name it something distinctive, and set the Clone Stamp tool’s ‘Sample’ dropdown menu to ‘Current and Below’, which will allow you to clone pixels directly onto your new layer without modifying the pixels beneath. One last thing to remember is that while it is always possible to correct colour fringing with Photoshop, it’s usually a good idea to start to minimize the process while you’re still taking your shots. Lenses that have been opened up to their maximum aperture tend to be more prone to colour fringing, so closing your aperture down a bit, if possible, can help to simplify your time spent on post processing edits. It may seem like a waste of money to spend $3000 on a single lens, but the extra cost isn’t just going to marketing. The more expensive a lens is, the greater its capabilities – but that’s not all. Different materials are often used in lens elements and optical coatings are more effective at minimizing effects like chromatic aberration. While it’s naturally not possible for everyone to afford the finest lenses available, the extra money really does go a long way towards making your photographs as incredible as possible. Buy the best you can afford, and you won’t regret the extra investment!